Remember that "mysterious" teaser that was obviously hinting at a Jet Grind Radio re-release? Well it was hinting at a Jet Grind Radio re-release. Which means that both our finest journalist, and anyone else with a penchant for pointing out of the obvious, can start patting themselves on the back. You nailed it, guys, take a bow. Today Sega formally announced that the port of Jet Grind Radio, also known as Jet Set Radio in the non-barbarian lands, is due a remastered, digital release on Xbox Live, PSN and PC this summer. The port will be feature upgraded, HD graphics. There's no concrete price yet, but previous Dreamcast ports have cost $8.99 each. 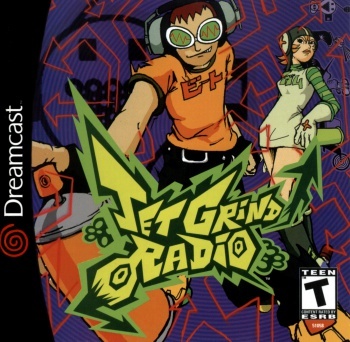 For those of you who didn't own a Dreamcast, Jet Grind Radio casts the player as the leader of a group of roller-blading vandals who hop around Tokyo defacing public property in an attempt to steal turf from rival gangs. It played very similarly to the early Tony Hawk Pro Skater series, albeit with more perpetually enraged police officers and attack choppers. Hopefully Sega puts out the cash to acquire the game's excellent, partially-licensed soundtrack. Previous Dreamcast port, Crazy Taxi, was released without its iconic Offspring soundtrack, and that just felt wrong.